The more you use HandBrake, the more you will discover its mightiness. For instance, when you have a pretty adorable movie video, but unfortunately it is exotic, while what's worse, there is no undertandable subtitle through the whole movie. At this moment, HandBrake can help you add subtitle onto that movie, and you can choose whether the burned subtitle has ON / OFF options. Read this HandBrake Subtitles Guide, you will learn to add Soft/Hard subtitle. [Notice]: New HandBrake 1.2.0 is available for Windows/Mac/Ubuntu! Subtitle Tips: Open/Soft Subtitles are "open to all" and cannot be turned off by the viewer. And Closed/Hard Subtitles are designed for a certain group of viewers, and can usually be turned on/off or selected by the viewer - examples being teletext pages, DVB Bitmap subtitles, DVD/BluRay subtitles. To add soft subtitles with HandBrake, first of all, you need to find your language subtitle from website. Though there is no 100% guarantees of availability, you still have great chance to get you desired language subtitles after an easy search on Google. Best subtitle file searching method: "movie title" + "your preferred language" + "subtitle" as the search strings. The raw subtitle file you downloaded is actually text files with time codes. It tells the movie to display a certain text at a specified time. Two of the most common formats for subtitle files are ".srt" and ".sub"
Using a common media player like 5KPlayer or VLC to play the movie, you can also display subtitles simply by putting the subtitle file in the same folder. The only requirement is that both the movie and the subtitle files should go under the same name but with different extensions. Something like "title.avi" and "title.srt". HandBrake enables you to convert DVDs, Blu-rays with subtitles and add subtitles into MKV, MP4 video files and so on. But the forced Subtitle adding with HandBrake (i.e. convert videos with forced subtitles only) is more particular in Blu-ray and DVD backup. And one thing to remind is that HandBrake does not decrypt commercial Blu-ray or DVDs. On Mac OS, you need to install VLC 64bit to cowork with HandBrake. While on Windows PC, you need third party DVD Decrypter software to break DVD encryptions. After open the DVD as Video_TS and Audio_TS folders, you can right navigate HandBrake to read these VOB file. Rename your Destination file, adding in the complete path. Now click the Subtitles tab and then click Add Track button. The subtilte track appears in the blank panel. Select English (Forced Caption) or other forced captions in español or Français. If theres more than one the 2nd or 3rd may be for hearing impaired or even the subtitles of a commentary track, you'd better take a test chapter. However, you may feel this is embarrassment to cope with so many program co-work together, and sometimes your HandBrake subtitles are not showing up. Digiarty Software exploits one-click solution to add hard subtitle from DVD movies with WinX DVD Ripper - a fast DVD ripper. This best HandBrake alternative allows you select internal/forced movie subtitles, as well as import SRT external movie subtitles before ripping and copying a DVD (including all kinds of copy-protected DVDs). WinX DVD Ripper Platinum - Allows the users to select soft, hard or forced subtitles when ripping DVDs. It can also add the external SRT subtitle files to DVDs in any languages. To ensure the safe and smooth external subtitle adding, please download and install WinX DVD Ripper Platinum or WinX DVD Ripper for Mac, the best subtitle adding alternatvie to HandBrake for Windows and Mac OS. After that, download an SRT subtitle files online corresponding to the target movies. Step 1. Insert a DVD or prepare a movie source in ISO or VIDEO_TS format, click the related button on the top left of the software until it adds your movie source. Step 2. 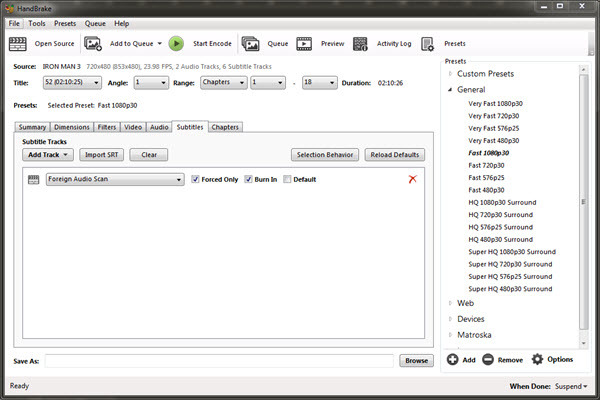 Select any output format according to your need before adding external movie subtitles. Step 3. Click Edit button to select "Add External SRT" option from drop-down list or click Subtitle Disabled button on the main title bar. Step 4. Choose "Subtitle" button, select "Enable Subtitle" and check "Extra" below it. Click "Add" button to build in the downloaded SRT subtitle just as shown in the picture. Step 5. Select language and position of subtitle and then hit "Apply to All" or "Done". Step 6. Hit RUN button as the final step before the DVD subtitle ripping begins. Can Handbrake remove subtitles from MKV or other videos? Check how to remove subtitles with Handbrake and the best subtitle remover to remove subtitles from MKV, MP4, etc. Learn how to rip DVD movies with desired subtitles to AVI, MP4, MPEG etc. on PC/Mac to help you better understand the movie..